Parra made his debut for France as a replacement against Scotland in 2008, making his first start for Les Bleus in a defeat to England at the Stade de France. Small in stature, Parra's strength is his keen decision making and tactical game, allied with a surprising turn of pace. He is also a front-line goal-kicker, having taken on the mantle at Test level. At club level he came to prominence with Top 14 strugglers Bourgoin, moving to heavyweights Clermont Auvergne in 2009 and striking up a strong partnership with Australian fly-half Brock James. In 2010 Parra was instrumental in guiding France to a Six Nations Grand Slam. After being paired with the equally youthful Francois Trinh-Duc at halfback he produced a number of masterful performances, including in a rout of reigning champions Ireland at the Stade de France. The following months were difficult for France as they were routed by South Africa and Argentina on tour, but Parra seemed almost immune to their plight after helping Clermont end their Top 14 drought with victory over Perpignan in the tournament finale. There were further issues for France in November but Parra returned to a good patch of form at the start of the Six Nations only to lose his place for a vital clash with England to Biarritz's Dimitri Yachvili. Parra continued vying with Yachvili for the scrum-half berth in the summer warm-up Tests though he impressed against Ireland on August 20 earning a man-of-the-match award for his faltless kicking display. And going into the 2011 World Cup, Parra found himself at fly-half to accomodate both him and Yachvili in the side. Parra performed well - despite widespread amazement at Marc Lievremont's decision. 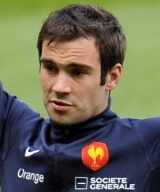 Parra appeared in seven of Les Bleus' matches with five at fly-half. Going into the 2012 Six Nations, Parra remained in the mix but had to, at times, play second fiddle to both Dimitry Yachvili and Julien Dupuy. But once back at Clermont, Parra was in sensational form to help guide them to the semi-finals of the Heineken Cup. Morgan Parra kicked 13 points in Clermont's win.